The origins of the project go back to the winter of 1993/94 when the committee, led by David Smith and Martin O'Keeffe, made an application to the Tipton City Challenge. The application which included drawings by Barrie Johnson and subsequently used in my donations letters was rejected, but the seeds had been sown. 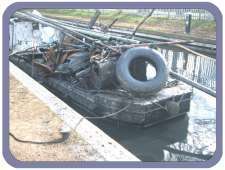 My practical involvement with the society work parties started in October 1994, and it was obvious from the outset that a work boat would benefit the situation greatly. At this time, after consulting the committee, I decided to raise finance for the work parties by writing begging letters to various companies listed in the "Guide to Company Giving" published by the Directory for Social Change. Our first success however came from a contact in the horticultural industry. I was working for the horticultural Peat division of Bord na Mona (Eire) and my immediate boss knew the managing director of Bulldog Tools who supplied tools to the trade. This was an opportunity not to be missed and after several letters we acquired £1000's worth of tools. Thus encouraged I set to and mail merged over 250 begging letters, the first fifty's postage sponsored by my then employers, Scotts UK Ltd. Now, if you like getting letters this is a great exercise but be prepared to be disappointed as 95% of the replies will be in the negative. So, the trick is to keep going but ask again if necessary. All in all I reckon we have mailed approx 500 items. A list of all the companies that donated money towards the boat will be published later. The posting consisted of a begging letter outlining the Society and its good works, a copy of the original Barrie Johnson boat drawing and a copy of the Galton Valley Adoption scheme. If you add up all the different sections of these headings, the tota lcomes to 47 tasks. However, it is not just a matter of filling in forms, but also includes getting information like copies of audited accounts for the last two complete years and a detailed description of the project, including an assessment of the importance of the heritage asset which the fund is being asked to support etc. etc. When you look at it you can see why the very large bids have professional people working on their projects. 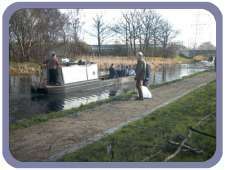 A detailed but short history of the canal in the area. A map of the Old Main Line giving its position relative to other canals. Details of local community benefits fromthe project. Set of slides to be used in a presentation to the trustees. Letter of consent from BW. All this by the end of December! Of course we couldn't get all the details by then and we requested an extension to the end of January, 1997. The final draft and details were in place on time and a phone call from Mrs. Shetty confirmed that she would be presenting our case to the trustees on the morning of Monday, 10th. March and that she would let us know as soon as possible. More waiting, but I had now changed jobs so I had other things on my mind. Monday, 10th. came and went with no phone call, oh dear, doom and gloom; this was not looking too good. Not to worry, bite the bullet, the following day I called the Heritage offices. "Mrs. Shetty is on the phone, can you call back ?" More torture! Well, the rest is history. I did call back and as Mrs. Shetty put it "Good news, Mr. Butler". So, what have we got? Well, we obtained a grant for £21,400 towards the cost of building the boat. This represents 90% of the total, the remaining 10% we have to find ourselves. This has been raised by donations made by companies mailed throughout last year so we are home and dry. However the grant is made subject to certain terms and conditions that will form a contract between BCNS, BW and the Trustees of the National Heritage Memorial Fund. Other terms are that the work must not commence until the contract has been signed and as a non departmental Public body, the Heritage Lottery Fund is required to observe rules regarding public announcements in the run up to an election. This is why you didn't hear the result immediately. So what is the timetable? 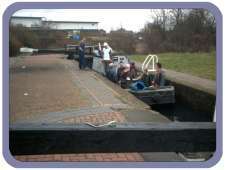 The contract for building the boat has gone to Oldbury Boat Services, good news on three accounts - they are on the canal close to home, they are members of BCNS and the money stays in the local community. OBS have reserved a slot for us from July until November, so we should have the boat for the Bonfire Rally. and if I have left anyone out please forgive me, but thank you all.